Ever since I started this food blog, I have come to realise just how tolerant my wonderful friends are. When we eat out together, they sit patiently by as I take photos of all our food. All the while they look hungrily on, twitching to start eating. I also suspect they silently groan every time I say “just one more photo”. But ever so supportive of my cause, they always let me taste their dishes without necessarily wanting to taste mine. One of my friends occasionally lets me order for her. (Am I spoilt or what?) I have therefore decided that there is definitely some merit in writing these restaurant reviews: I get to eat my food, and I get to try everyone else’s too. Could there possibly be a more winning combination? But in what was to be a first, I recently found out what it felt like to eat out with someone like me. Having got in touch with a professional food writer recently, we decided to meet for lunch; our choice of venue – Tom Aikens, one of the restaurants currently taking part in London Restaurant Week. So here we were the two of us, at a one-star Michelin restaurant, with notepads in hand, scribbling madly away. And there was also the not so subtle matter of our photo taking: swivelling plates around for that ever better angle, rearranging the table for perhaps a more superior shot. What a sight we must have been to behold, both snapping crazily at the food like Japanese tourists! And oh no, it wasn’t just one photo, but at least two, three or four of every dish. At one point, I almost elbowed my dining companion in the face as I scrambled to take better aim. And we really couldn’t have been missed. With only five tables occupied during our sitting, less than half of those available, the black and white dining room was rather quiet and a little stark. And so what did we think of the food? An amuse bouche of confit of rabbit with a celeriac mousse and black truffle was lovely; bursting with earthy, aromatic slivers of truffle, the robust rabbit melded wonderfully with the creamy mousse. This was more triumphant than the tartare of mackerel with beetroot and beetroot dressing, the combination of which tasted incoherent. 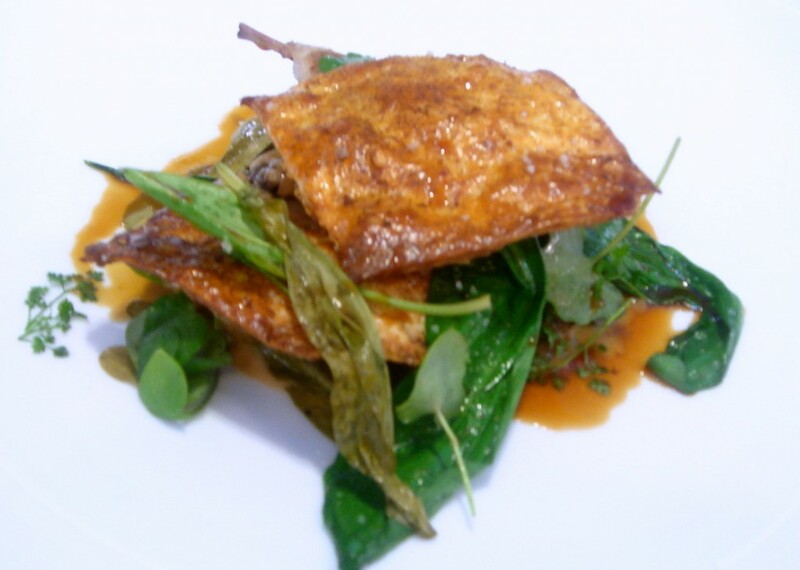 A main of pan fried quail breast with morel mushrooms, confit leg and garlic leaves was lovely; rich and deep with flavour. However, it was followed by a fillet of turbot with cauliflower crumb, cauliflower purée and cauliflower beignet that was uninspired and slightly bland. 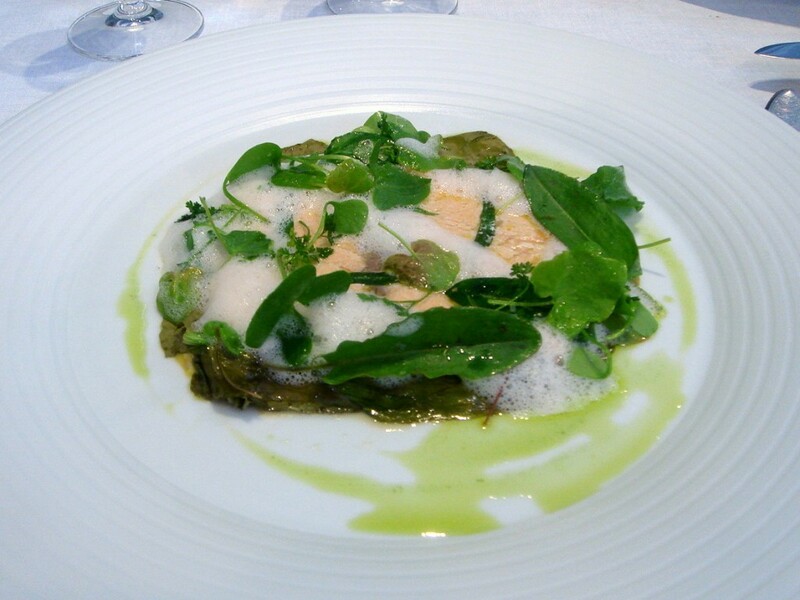 From the fish menu, a baked Loch Duart salmon with sorrel, lemongrass, tarragon oil and scrambled egg was disappointing. It was over seasoned and left drowning in lemon. 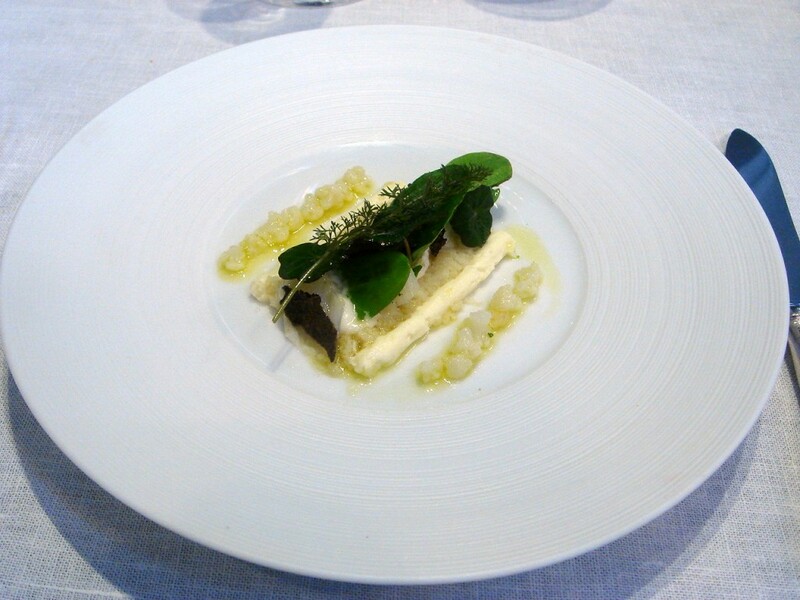 The result was a dish that was uneven, unbalanced and harsh on the palate. 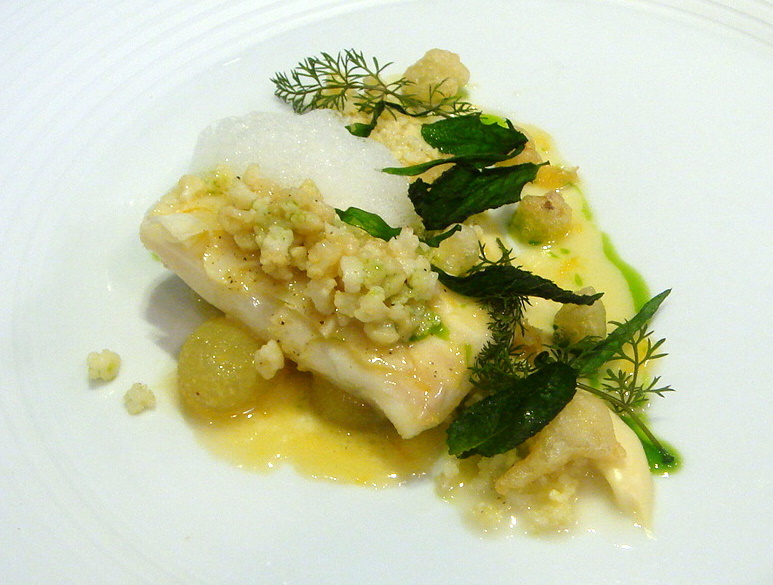 A poached Pollock with brandade mousse, cauliflower purée and pickled cauliflower was also heavily salted and failed to deliver any great flavour. 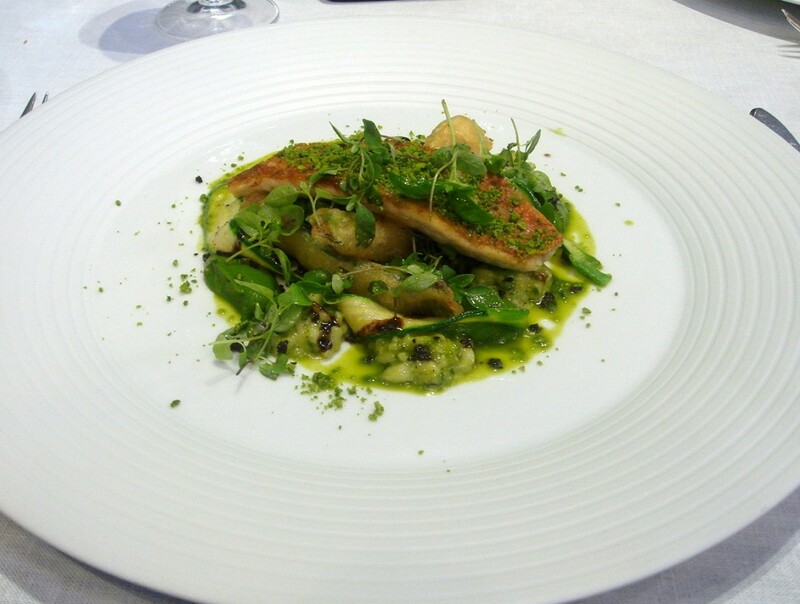 But a red mullet with pistachio risotto, pistachio crumb and courgette beignet was very pleasing. A thoughtfully constructed dish, it demonstrated a great combination of tastes and textures. On to dessert, and poached rhubarb with mint mousse, pink champagne jelly and rhubarb sorbet achieved a ‘just right’ level of tartness, although, oddly, the rhubarb proved difficult to cut. My dining companion also found the mint overpowering. Cheeses had reached varying degrees of ripeness, although on the whole, they were pleasant. Overall the food was uneven and patchy. The level of seasoning needs to be revised and certain compositions required revisiting. That said, some dishes commanded respect and showed that at his best, Tom Aikens, who was in the kitchen during our visit, can indeed be a masterful chef. Also worthy of mention was the bacon brioche. One from a choice of six in the bread selection, it was outstanding; perfectly crispy on the outside and soft on the inside with delicate bursts of bacon flavour. Service was reasonably attentive, although the waiters could have been more pro-active in filling up our water glasses more regularly, especially as the restaurant was barely full. On a trip to the bathroom, the waiter did not wait until I had returned to my chair before serving the amuse bouche, which I found unusual and ill-thought out. The wine selection contains over 200 choices with the focus heavy on French wines, in particularly those from Burgundy and the Rhone. There are also a reasonable number of options by the glass. The standard lunch at £29 and the fish menu at £32 both represent good value, even if there were inconsistencies in the cooking. Furthermore, the fish menu (available until Easter) includes coffee and petit fours. However, if the food during a dinner service is as uneven as what we had been served, I would question the value in paying £65 for a full price menu. But all said and done, our lunch was thoroughly enjoyable and it made for some titillating conversation too: “do you think it was over seasoned, or just heavily seasoned?” and so forth. And on that note, I discovered that I have made a new friend, and that is something pretty hard to beat. Tom Aikens is open Monday to Friday. 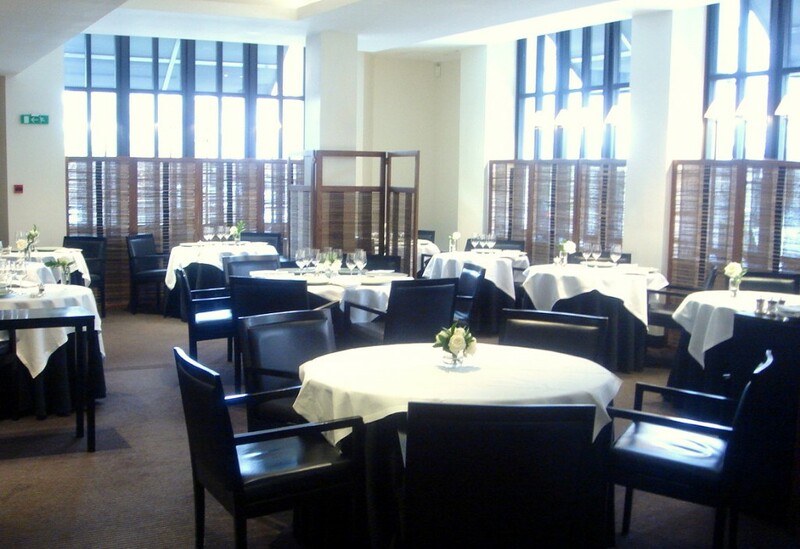 Previously closed on weekends, the restaurant will also open for dinner on Saturday evenings from 28 March 2009. Price – The three course set lunch menu is £29. The four course fish menu, including coffee and petit fours, is £32 and available until Easter. Three courses from the à la carte menu is £65. Excludes drinks and service. Great photos! 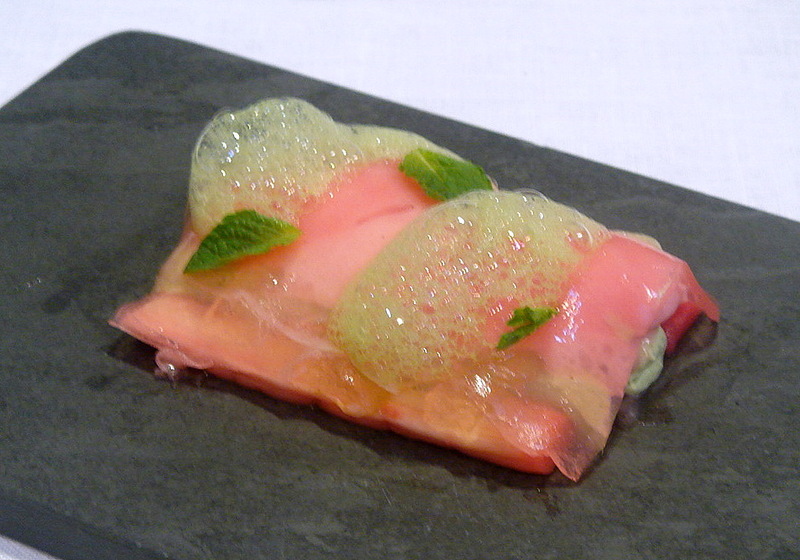 I’m in love with this rhubarb dessert. I probably can’t make it exactly like this, but this gives me a great idea for a recipe! Yeah, it’s always nice to get ideas from good restaurants and try them at home. A hub of inspiration. I agree with Natasha: great photos! Also, this was an entertaining and informative review. I’ve never eaten out with another pad-scribbling and photo-happy foodie, but it sounds like fun! At least for me. Maybe not for the other foodie once they realize what a hack I am with my camera… 🙂 Thanks for sharing this! Good to hear that you enjoyed your meal there. You’re probably right. With the full price menu he was probably more attentive. But there’s no excuses for poor cooking. But yes, generous portions have always been his style. I don’t think I was trying to be generous, just factual. I can see how a meal at Tom Aikens can be extremely disappointing if you have to pay full price, and I hope I made this point in my review. I only went for a set lunch menu, so I need to take this into consideration, given the lower price tag. But compared to about 6-7 years ago, I definitely think its standards have dropped.